You have royalties waiting to be collected. Let us get them for you. If your music is being distributed, performed worldwide, and you don’t have a publishing deal, your royalties are sitting in collection societies around the world waiting to be claimed by you. The problem is that in order to collect these royalties, you need direct relationships with each society in each territory. Doing this takes time, paperwork, and a lot of upfront fees. Worst of all, if you don’t register in time to collect your royalties, the collection societies will retain the royalties and you will miss out on additional revenue. Publishing Administration may be a little complicated. We understand that you are an artist who is busy with gigs, social media management, and a number of other important things. If you’re getting lost in the process, check out the video below (which contains some nifty graphics) and some additional resources we’ve put together to help you out. Below you will see what this process would cost you with our cost-effective solution and what it may cost you if you do it yourself. You’ll see what exactly we’ll be doing on your behalf and the overall value you’ll be getting – not to mention the time you’ll be saving. One-time fee to join. We’ll take 15% of the publisher’s share of your royalties as you earn them; the rest of the publisher’s share, and the full writer’s share, go straight to your bank account. …on sign-up fees plus some yearly fees to register with all of the PROs and mechanical societies we’re already affiliated with. If you’re not already affiliated with a PRO, we’ll provide you with a clear, detailed guide to get you affiliated with BMI for free. 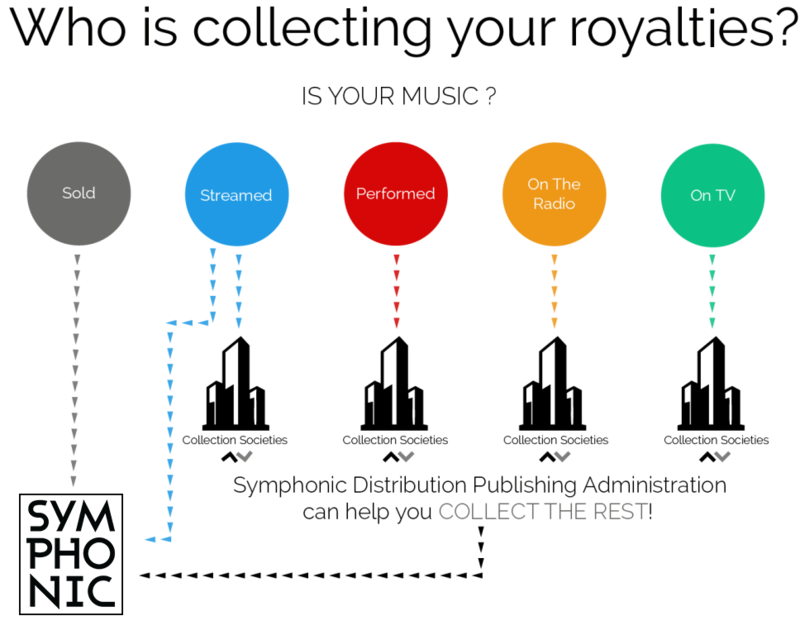 We’ll represent your songs to mechanical collection societies. You’ll have to figure out with which PRO and how to affiliate. You won’t be able to register with some mechanical collection societies which only work with publishers rather than individual indie songwriters. Register your song once with us, and we ingest & implement that registration automatically to societies worldwide. We also show you the registration status of your songs. You’ll need time to establish your identity and build accounts with dozens of societies. Not to mention song registrations with each one. And we’ll keep adding more. We collect your royalties in yen, euros, and pounds and pay you in dollars. It takes time & hard work to establish and maintain relationships with dozens of societies who may not speak your language or pay in your currency. We’ll pay you up to 13 different royalty streams. We’ll look for royalties in places you’ve never thought of. We’ll compare your publishing royalty reports to your distribution sales reports, double checking to ensure you’re getting the royalties in the territories you deserve. Societies don’t just immediately start paying you cash. You’ll need to invest time in researching to even know where to look and to dig for royalties. You didn’t become a musician to be an expert in copyright and foreign exchange. Let us do the heavy lifting so you can get back to writing. Fill out the form below to sign up to our Publishing Administration service. Our team will review your submission and will advise you if accepted via email notification. Upon being accepted, you will be redirected to a sign up page provided by our partner, Songtrust.